FLiDAR NV has developed the world’s most accurate buoy integrated Lidar for wind resource assessments. The state-of-the-art LEOSPHERE WINDCUBE®v2 LiDAR equipment has been installed on a custom-made data buoy platform designed by world-leading buoy manufacturer Mobilis. Hydrosphere UK Ltd are the UK distributors of the Mobilis range of navigation marks and data buoy platforms. The Mobilis data buoy comprises a large hull constructed from multiple-section polyethylene floats bolted around a central steel structure. 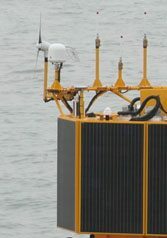 The data buoy provides a stable base to support the large aluminium tower holding the LiDAR equipment. The FLiDAR buoy platform, which is modelled on the standard Mobilis DB 17000 was chosen for its track record as a robust, stable and flexible data buoy platform. The DB 17000 is able to withstand some of the harshest marine environments, has a flexible and secure mooring arrangement to allow deployment in all water depths and utilises a modular design meaning that components can be maintained and replaced individually, reducing the need for spares holding. This wind assessment technique provides data in a shorter timescale and with less outlay compared to a traditional fixed mast, and with a smaller environmental footprint. It also offers the flexibility to move the unit to another site should measurements be required elsewhere. Go to the data buoy platforms application page for more examples of Hydrosphere’s data buoy projects. FLiDAR NV, a joint venture between 3E and OWA, has developed the wind measurement buoy over the last four years. It represents a major break-through for the offshore wind industry enabling dramatic cost reductions for offshore wind resource assessments. FLiDAR can measure wind potential up to 200m above mean sea level with an accuracy equivalent to the performance of offshore fixed met masts, at a fraction of the cost. 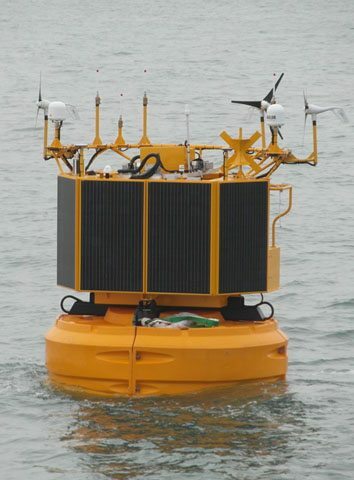 It is made up of an offshore WINDCUBE® v2 LiDAR mounted on an industry standard buoy and powered by an autonomous renewable energy (PV + wind) system. A mechanical stabilisation unit and advanced correction algorithm ensures maximum stability and excellent measurement data accuracy. FLiDAR can be deployed in a single day and can provide crucial data throughout project development.